The media gets a bad rap for oversimplifying, misrepresenting, and even sensationalizing stories. Stories about science are no exception. But it is also no secret that the scientists themselves are under all sorts of pressures to oversimplify, misrepresent, and even sensationalize the science. But sometimes even good science and good reporting can lead to inaccuracies in “translation” that may look like (intentional) oversimplification, misrepresentation, or even sensationalization, when in fact these inaccuracies are due to honest, understandable, and avoidable misunderstandings. One of the sources of this honest misunderstanding comes from cognitive neuroscience’s usage of everyday mental terms. Often the scientists’ usage of mental terms differ in important respects from the everyday understanding of these mental terms, and the particular idiosyncratic (from the everyday-use point of view) ways in which the scientists are employing the terms aren’t always made explicit. For an example of how the misunderstanding in use of mental terms can lead to what may look like sensationalized reporting, see the numerous media reports on Han and colleagues  finding that acute cannabinoids impair working memory in mice through glial cell receptors. 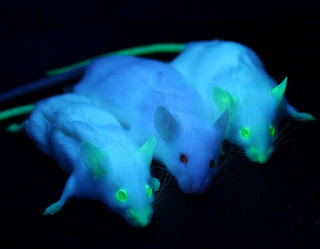 Glowing lab mice. True story. But different experiment. According to the media reports, the scientists uncovered a surprising cellular mechanism—glia, not neurons!—for working memory deficits associated with marijuana use. So far, so good: This is what the scientists claimed they were testing in their study and is also what they claimed to have found in their study. Not too far into a Scientific American article by Ruth Williams, the author notes, "This is one of the first studies to suggest that glia play a key role in conscious thought." And a Big Think media report  is even titled "Marijuana Opens New Field in Consciousness Research." Whoa! Mice have now become a model to study conscious thought! Amazing! How in the world do the media reporters go from "glia plays a role in marijuana-related memory deficits in mice" to "consciousness research"? Most people's first reaction is probably: This must be a case of media sensationalization. But I must admit my first reaction was: This must be a case of scientist sensationalization (and the media is merely passing the message along). But the more likely explanation is probably a lot less sinister; it is probably a case of honest, understandable, and avoidable misunderstandings. This line of thinking could quickly lead one to (reasonably) believe that the researchers have uncovered a cellular mechanism associated with effortful conscious thought. And, of course, as noted above, the reporters do end up making such claims. Unfortunately, Han and colleagues aren’t talking about this sort of conscious, explicit, and effortful working memory processes. 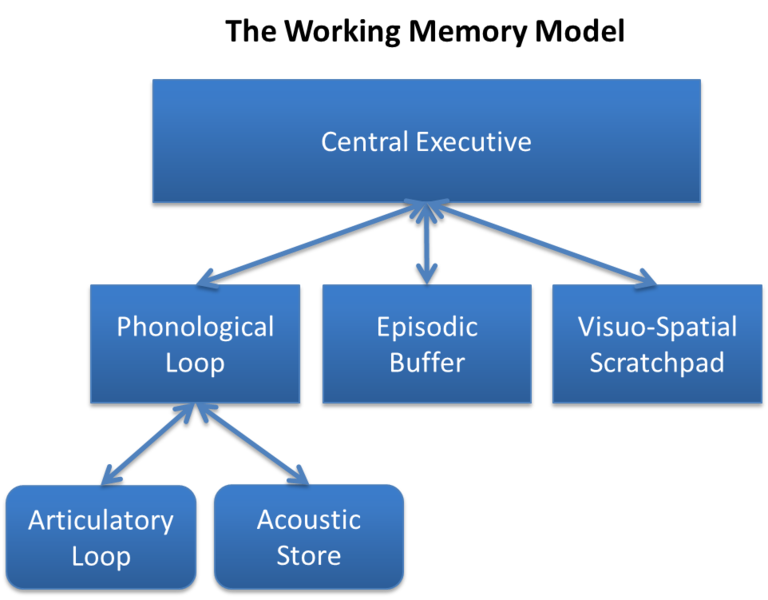 Rather, they are talking about spatial working memory, and, in particular, spatial working memory processes that are not necessarily explicit, conscious, or effortful. Even more unfortunately, these types of working memory processes may have cellular mechanisms that are dissociable from the more commonly-associated-with-working-memory conscious, explicit, and effortful processes. And even though Han and colleagues are clear in their article that they are talking about spatial working memory, they are not clear that they are talking about processes that are not necessarily explicit, conscious, or effortful. Additionally, Han and colleagues are not particularly clear in communicating the idea that the findings associated with deficits in non-explicit, non-conscious, non-effortful spatial working memory processes may have little to nothing to do with the sorts of working memory processes that would typically come to mind when a reasonable and educated person was to think of working memory. Thus, the “consciousness” claims made by the media are probably not the result of media sensationalism. Rather, these claims are more likely the result of honest, understandable, and avoidable misunderstandings. And these misunderstanding may actually matter. This sounds like an exciting potential, but the potential is really only exciting to the extent that one misreads the implications of Han and colleagues findings. Han and colleagues findings shed light on a very particular working-memory process, and the findings related to this particular working-memory process may not have much to do with the sort of marijuana-induced memory deficits that we care the most about. Figdor, C. (forthcoming) What is the “cognitive” in cognitive neuroscience?” Neuroethics. Han, J., Kesner, P., Matna-Laurent, M., Duan, T. Xu, L., Georges, F., Koehl, M., Abrous, D., Mendixabal-Zubiaga, J., Grandes, P., Liu, Q., Bai, G., Wang, W., Xiong, L., Ren, W., Marsicano, G., & Zhang, X. (2012) Acute cannabinouds impair working memory through astroglial CB1 receptor modulation of hippocampal LTD. Cell, 5, 1039-1050. In my opinion, Han and colleagues actually welcome the misunderstanding by framing their study in this way. After all, when we think about marijuana-induced forgetfulness (or even more to the point, the most salient problems associated with marijuana-induced forgetfulness), it does not seem that we are primarily concerned with the particular phenomenon that is actually under study in Han and colleagues study.